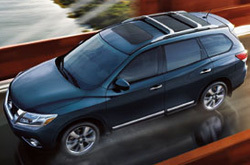 Thank you for selecting Texas Nissan as your source for 2013 Nissan Pathfinder reviews. Don't stress out over your next purchase; look to the chief Nissan retailer in Dallas - Fort Worth for thoroughly researched reviews written by industry specialists. Once you begin to read, you'll find that this article is bundled with usable features and information. Don't wait any longer - get started on your research! 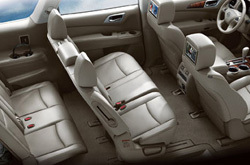 When considering the 2013 Nissan Pathfinder side-by-side with the 2013 Mazda CX9, Dodge Durango, GMC Acadia, Chevrolet Traverse, Ford Flex and the Ford Explorer, and you can catch that the Pathfinder transcends those autos in many parts. Check out the hightlights below. No megacorp car repair sites in Dallas - Fort Worth, Texas offer Texas Nissan's amazing combination of certified Nissan Pathfinder service techs, long warranties on all jobs and Nissan OEM parts. With backing from Texas Nissan's car repair aces your Nissan will run its best for years. We will take care of a task as easy as an oil change, or complete difficult auto repairs and service like timing belt replacements, strut and shock repairs and Nissan transmission rebuilds. On top of this you can expect thrifty prices on all jobs, as well as hassle-free service every time you stop by Texas Nissan. The link underneath this sentence is your path to savings! Click now and you'll be linked to our coupon specials page!